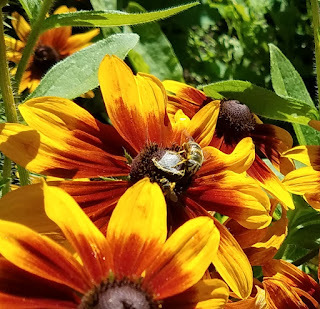 It may seem like common sense to plant blooming flowers near vegetable gardens that attract bees and improve pollination, and end up with a fabulous harvest. Interestingly, some of the plants we commonly grow in our Minnesota vegetable gardens don't require insect pollinators to set fruit and thus can produce without the help of bees. Peppers, for example, are wind pollinated meaning just moving the plants in the breeze will blow the pollen from one flower to another give you peppers. But would peppers produce bigger, better fruit with improved seed set (more seeds = better pollination) with flowers planted nearby? A study in Brazil by Pereira et. al, (2015) found that planting bee-attracting flowering basil between rows of bell peppers produced fruit that were heavier, longer and wider in size with more seeds than large stands planted only with peppers. As an extension educator, I often recommend that flowering plants be part every vegetable garden both for beauty and, more importantly, to attract pollinators to improve fruit set. I wanted to be sure I was giving accurate advice, so decided to try my own experiment to see if this is true. My colleague and Extension fruit and vegetable educator, Annie Klodd, and I consulted with Extension vegetable specialist, Dr. Vince Fritz. We started about 180 Ace bell pepper plants in March in the greenhouse to be planted at four sites and managed by Master Gardeners volunteers: Marge Kelly, Jeffrey Anderson, David Hayes, Gail Ruuhela, Betsey Norgard (Grand Rapids); Greg Towne (Arboretum); Julie Coopert (St. Paul campus); Kelsey Wulf, Extension educator (Perham). The project is funded by the Minnesota Food Charter. 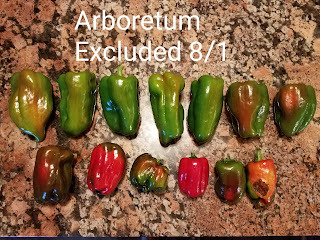 At each planting, half the peppers (18) are left open to pollinators while the remaining peppers (18) are covered with a mesh that would exclude pollinators. Peppers are harvested when they start to visually ripen (turn red or orange) indicating they have reached their maturity. 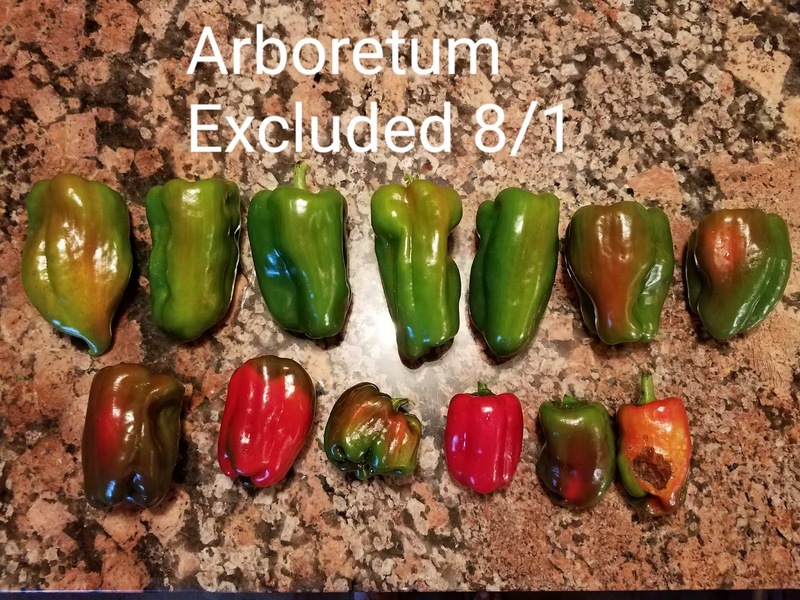 Data collected includes number of peppers harvested from each area (open and excluded), total harvest weight, average size (length, girth), and total weight of seeds. excluded areas. It varies. In St. Paul. the open peppers are still green while we have collected peppers from the excluded area. The Grand Rapids team has just started collecting peppers. The Arboretum site is prolific. Keep checking back here for more updates!